The living room is one of the best places to hang out at home. It is also the first room that your guests will notice when they drop in. Therefore, your living room has to be epic and splendid. And these 8 splendid rustic living room ideas are all that you need. This rustic living room looks airy and bright due to the floor-to-ceiling windows and door. Another thing that makes it airier and larger is the vaulted ceiling. Vaulted ceiling tends to draw people’s eyes upwards so it would be nice if the rustic look is focused on the ceiling. You can have a hefty exposed beamed ceiling with some distressed wood boards. To add elegance to this rustic living room, a red Persian rug is laid on the wooden floor, anchoring the seating area. A fancy crystal light hangs above the coffee table, making the room look more impressive. Exposed beamed ceiling always adds character to the living room. Vaulted ceiling makes the living room look airier and larger. It will be harder to do everyday upkeep. If you want to add a little bit rustic look in your modern farmhouse living room without being exaggerated, you can do it with the wall. Try installing tongue-and-groove paneling for the wall using distressed wood planks. But if you think that is too much, you can install the paneling behind the television set. The area behind the TV set is usually used as the focal point of a living room. And as a focal point, your guests will tend to see it more often. Therefore, making it rustic would be great. Do you want more rustic touch? You can make a DIY wooden coffee table from wood planks. The texture and design of the table would suit the wall well. A small living room is not a dead end. You can still have a rustic living room even if yours is undersized. Since your living room is tiny, you cannot cram many pieces of rustic furniture. You can go with some essential furniture and décor, then arrange them in a nice layout. Instead of having a large wooden coffee table, you can try a smaller and effortless one like an old suitcase, chest, or rattan ottoman. You can also store some woods next to the fireplace so you can grab them in a jiffy when needing them. Besides, the stacked woods would embellish the bland wall perfectly. To accentuate the fireplace, a round mirror decorated with antlers is hung above it. Sometimes, deciding what would be the best color for your living room’s wall is not that easy. Why bother? You can just ditch the cement and paint, and let the bricks be exposed. An unfinished touch like an exposed brick wall can add the touch of a rustic look to the living room. But, instead of applying exposed brick wall to the entire living room, you can opt to apply it only at a certain spot, for example, the fireplace. The combination of exposed brick wall and hefty wooden posts accentuates the fireplace well, creating a classic and relaxing ambiance to the living room. A picture of nature hangs over the fireplace to fill in the blank space. The rustic look is not always about earthy color hues and distressed wood interior and furniture. Anything that exposes outdoor elements will bring a pretty good rustic look to your living room, just like these stone fireplace. The stone wall adds an epic transition of the modern and classic design. Although exposed brick or stone walls belong to the classic era, many homeowners are still crazy about this look. The best place to apply this kind of wall is at the fireplace or behind the TV set, as both of them tend to be the centerpiece of a room. In this living room, for instance, stones decorate the fireplace well, highlighting its look. They are also whitewashed to complement the color of the walls and trims without compromising the rustic look. All you need to create a rustic living room is here. The soft leather sofa sitting by the round table is a nice place to curl up. 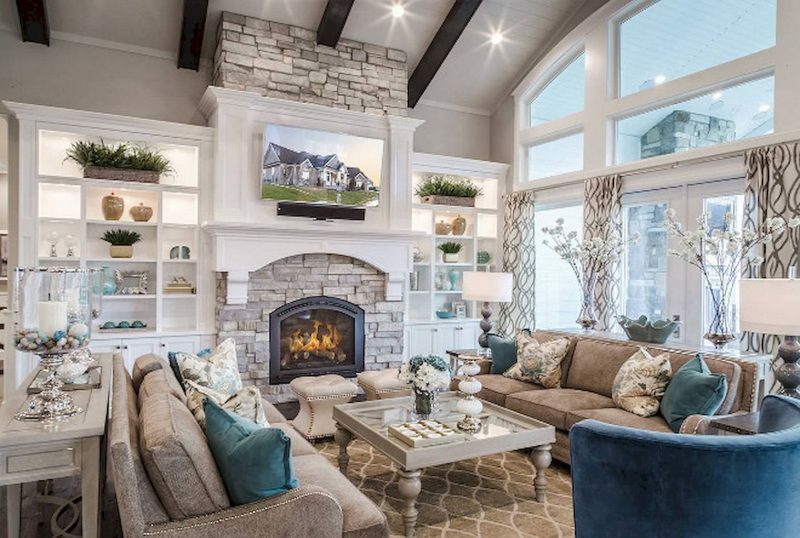 A soft beige sofa with hand-stitched upholstery sits perfectly in the middle of the living room right in front of the fireplace. It would look awkward if the sofa just sat in the middle of a room without anything that covers its back. It would not seem right if you exposed the flaws of the sofa’s back. Therefore, you need something that can cover it. A table – for example. Just make sure it is lower than your sofa so you will not bump your head. This rustic table is a perfect choice to anchor your sofa as well as covering the blemishes. Its color blends with the sofa perfectly. The elegance of a shabby chic living room is embodied by the gray linen sofa and crystal light that hangs above the round coffee table. Tongue-and-groove paneling lies on the wall behind the sofa along with the classic round bronze clock that emphasizes the rustic look of the wall. To hold the clutter at bay, a wicker basket holding your magazines and newspapers is placed by the sofa. The light adds the touch of elegance to the living room. The light is so low that you can bump your head. When stepping into this living room, you will be amazed by the interior that is full of wood logs. You can find wood logs almost everywhere especially on the wall and ceiling. The coffee tables might be the most conspicuous thing in this living room. They are made of an abundance of twigs that are glued together to form three tables which you can put your snacks on. Those are 8 rustic living room ideas that will make yours become epic and splendid. And you will always want to spend more time hanging out with your family there.